IT'S TOFFEE'S TURN: Muhyiddin cries foul over Ghani move. Although no official announcement has been made, Muhyiddin is crying foul on the selection of Abdul Ghani Othman as the candidate to contest lim Kit Siang and is demanding that Najib stop playing tricks with Johor. Pakatan Rakyat (PR) has made inroads into Pahang, PR is confident of putting a huge dent into Pahang - Najib's home state and PAS is even threatening to unseat Najib which is a possibility if Haidi stands against Najib but that is rather unlikely as Hadi has to be in Trengganu. Whilst all this happening Muhyiddin knows he has a battle in Johor and is concentrating on putting all his effort there to retain Johor as a BN Fotress and with Kit Siang there it is beginign to look difficult. If Muhyiddin manages to keep Johor intact with a few dents of course, he will make Najib look like a novice and will strengthen his claim to remove Najib as Prime Minisiter, now Muhyiddin smells a rat in Najib's schemes. Najib needs Muhyiddin out or he needs to show that Muhyiddin is not a good leader so he must do something drastic in Johor, and the only thing he can do in that direction is to assure a Kit Siang victory, moreover to balance things in parliament he needs a Kit Siang of his other party members will run wild, he needs to have a rein over the MCA adn the Gerakan and for that he needs Kit Siang to win or the MCA and Gerakan chaps will start demanding a lot out of him. Now to undermine Muhydiddin he has made known to Ghani that Ghani and he has informed Ghani that unless he is willing to offer himself to fight Kit Siang if he (Najib) needs him to he may not be fielded as he has to give way to the young blood in Johor. Johor is gong to have the most new faces as the young turks are becoming more and or influential and he has to break their grip on UMNO Johor. Placing Ghani to face Kit Siang is justifiable and it is also opportune for Najib, he has so much to gain, if Ghani loses he discredits Muhyiddin, if Ghani wins he takes the credit, and so for Muhyiddin, Ghani's stand agaisnt Kit Siang is - "a heads you (Najib) win tails I (Muhyiddin) lose battle. 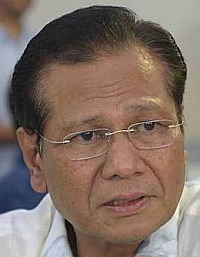 The first option was to place Tee Keat agaisnt Kit Siang, and if he does that Ong Tee Keat may very well prove to be the giant killer as there are many Chinese who still like the man, but Ong Tee Keat is still very safe in Pandan there he looks like a sure winner so why risk it? Place anyone else in Pandan and the BN will most likely lose the seat, so Najib is having second thoughts about Pandan, he has toyed around with the idea to let Chua Soi Lek stand there to finish him off for good, Chua has served all Najib's purposes and he has no need for Soi Lek anymore. Najib's biggest delima is he has so many new faces in UMNO and he can handle it, or so he thinks, but he is finding it very to difficult dictate terms with the likes of MCA, Gerakan and MIC and his UMNO peopel especially Muhyiddin is getting very furious with Najib's choices. Then the second option was to place Chua Soi Lek in Gelang in an apparent BN suicide bid to get rid of Soi Le whose services are no longer needed in the BN and also to rid the BN of his son, with that move Najib kills two birds with one stone. Soi Lek has been giving his son total publicityin the MCA controlled media, to boost his image, the truth be told his son is now one of the most hated Chinese by the Chinese in Malaysia, the BN knows this and Najib knows this as well, it is not good for BN, he is ranked higher than Yen Yen among the hated in MCA, so Najib has to be careful about it, but Soi Lek has been harping on Batu Pahat for himself after all that is his Shangrila and that is where he want's to be. Now to complicate issues, Soi Lek's deputy thinks both Tee Keat and Chua shoudl not be fielded, he has privately informed Najib about it, so it looks like a a great power game is shaping up in MCA, the health minister is least bothered about how MCA fares he is just thinking of himself and his greatest chance to take the MCA presidency. With all this Muhyiddin is crying foul, for the moment Najib is holding the deck, and he intends to hold it close to his chest, he is having trouble with placing Shareezat, and Khairy, he does not know what to do with his favourite Rais Yatim he has to forsake him and no one wants him, his cousin is a huge burden, he has to give him a seat, and if he does he will have to place him in the cabinet that is if BN wins and he knows that his cousin is a fool and can't handle anything. Hishamuddin has the worst report card for his term as Minister of Home Affairs, yes Hishamuddin, he has scored even worse that Ng Yen Yen, who is already a wash out, followed by Rais Yatim, Nazri, Subramaniam, and Muhyddin. In fact all these people sat in lofty offices for five years doing nothing for the rakyat, Yen Yen of course has spent has done some wonderful things - the Psy concert, and the Chinese new Year celebrations in Melaka. An already incompetent Prime Minster followed by incompetent Ministers, how does he get out of this rut? Get Kicked out!! that is the only sensible answer. Very good one, Toffee! Have to agree with your analysis lah. The days are closing in on 'em horrid BN dinosaurs.